The world teaches us much about Wisdom, or at least the concept of it. Wisdom runs the gamut from the simple and logical to the clever and strategic. We’re taught lessons all our lives and build up repertoires of wise saying and teachings. Remember Aesop’s Fables and The Boy Who Cried Wolf – (people won’t believe a liar even when he speaks the truth), or the Tortoise and the Hare – (slow and steady win the race), and The Dairymaid and Her Pail of Milk – (don’t count your chickens before they hatch)? All good, sound advice. Even wise. The message is this: we need to value the Word of God, then engage our ears, heart, mind, voice, and eyes toward it, then we will understand and find knowledge/wisdom of God. Note that the heart commonly refers to the mind and is the center of all reason and emotions and will, i.e., our whole self and inner being. Out of the heart, mind, and will of man full of knowledge and wisdom springs forth all speech, sight, actions and conduct. In the opening of chapter 2, still speaking to a young man, a son specifically, in a continuation of Chapter 1, Solomon highlights this recipe for right reverence and knowledge of God. It is that combination of mental acceptance and commitment to discipline, a heartfelt leaning toward understanding, even an honest cry out and earnest seeking for insight – like a hidden treasure. 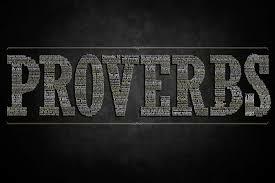 In my early decades as Christian I used to study Proverbs, even try to read them every day each month. Ever try that? I’d get to about day 3 and then get off schedule and try again 3 months later. I was never consistent. I really believe my heart was leaning toward God but my search for deep, deep knowledge of God was inconsistent or comfortable with only so much depth. The wise option is to walk in the ways of the good and keep to the paths of the righteous. The upright and blameless will live in the land, the wicked and unfaithful will be torn from it. In practical terms, of course, Solomon is advising young men of his day – Jewish young men, actually. This word of warning and references to the land had very specific application to the nation of Israel in the early years of the Jewish kingdom. Recall that King Solomon reigned from 970-931 B.C. So does this warning even apply to us? Yes, absolutely. Real wisdom in the form of a fully (all in) surrendered heart, mind, and will to God/Jesus brings success in life navigation, pleasure, discretion, and protection from the lures of seduction. The application of real Wisdom is the real reward of this present life. Are you experiencing the benefits of Wisdom/Knowledge of God?